First of all, I must apologize for not keeping this blog as often as I intend to. There are reasons (there are always reasons), I am being kept very busy by the many editors at Pearson. For those who don't know, I am nearing the end of a new edition of my grade 12 world issues book. The topics in this book are so interesting that it is not an unpleasant task but there are just so many details (and people) involved in the process that it keeps my busy. There are constant queries about everything (photos, captions, thinks that are not clear) as well as editting the chapters several times each as they go from Word files to something that looks vaguely book-like to proofs of the pages (without all the illustrations) to, well, you get the idea. It gets to be a problem when three or four editors working on different aspects of the book all want your attention at the same time. To be subject at hand, weather. Compared to the Toronto area we have had a pretty easy time of it here, although it has been colder than average for this time of year. 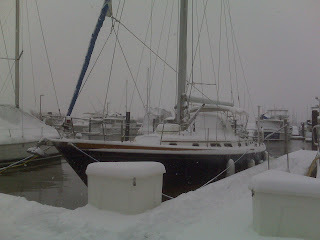 We did get about 8" of wet snow one day (pictures below) that I shovelled off the boat with a plastic dust pan and deck broom - that worked pretty well and got 98% off before the freezing rain came that night to make things really hard. The marina staff shovel a path down the docks so it is pretty good overall. This morning there was a bit of ice around the boats - they did not put the bubblers on until this morning and they were breaking up the thin ice that had formed. It is supposed to get warmer starting on the weekend. 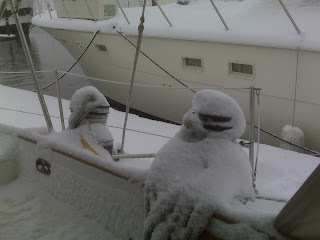 It will be nice to do some boat work outside when it happens. Posted by Bruce at 12:26 p.m.